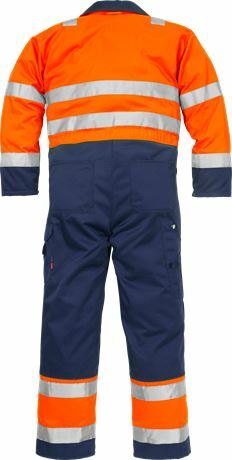 High visibility coverall with knee pockets in dirt, oil and water repellent fabric with 2-needle stiches on all reflective tapes for high durability. 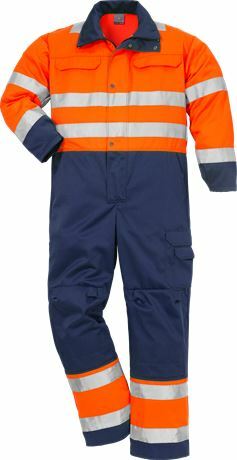 Material: 70% polyester, 30% cotton. 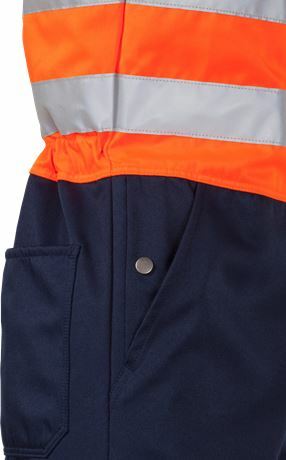 Front placket opening with two-way zip to top of collar and snap fastening / 2 chest pockets with flap and velcro fastener / 2 front pockets / Back pockets / Adjustable cuffs / Inside pocket with button / Adjustable elasticated back / D-ring / Side openings / Leg pocket with flap and velcro fastening, phone pocket with flap and velcro fastening / Folding rule pocket with pen pocket, and button and loop for sheath knife / Knee pockets with opening for height adjustable knee pads / Reflective tape on shoulders / Approved according to EN 14404 together with kneepads 127440 and EN ISO 20471 class 3 / Leasing laundry-tested according to ISO 15797 / OEKO-TEX® certified.